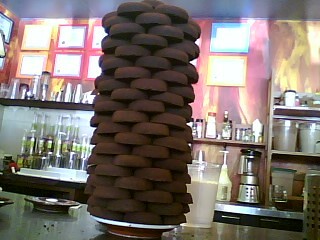 Leaning tower of Espresso Pucks, originally uploaded by maryspics. I have been wondering lately a bit about the old folks and some of their weird habits. A local old timer of coffee always has this habit of smelling the pucks constantly between shots. I wonder what he is trying to accomplish sometimes and what truth lies therein. I know when you do an excellent vac pot, the aroma shows up nicely in the grounds and the 'sweetness' is evident. Would the same be true in an excellent espresso? I don't really have an answer but some pucks sniffed today did have a very mellow sweetness in the better shots. I couldn't really correlate anything to form a theory and with the espresso as it is, I won't venture absolutes. The smell thing does make me believe there is something to it though even if I were to acknolwedge it, I don't know if I would change my routine much.